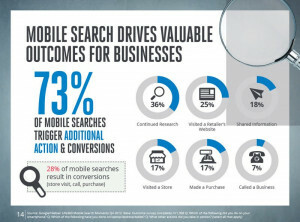 Impact of Mobile Search - Is Your Marketing Ready? Searching the web from mobile devices is projected to overtake desktop search by 2015. That fact doesn’t seem surprising as it appears that people are tethered to their smartphones as if it is an extra appendage. 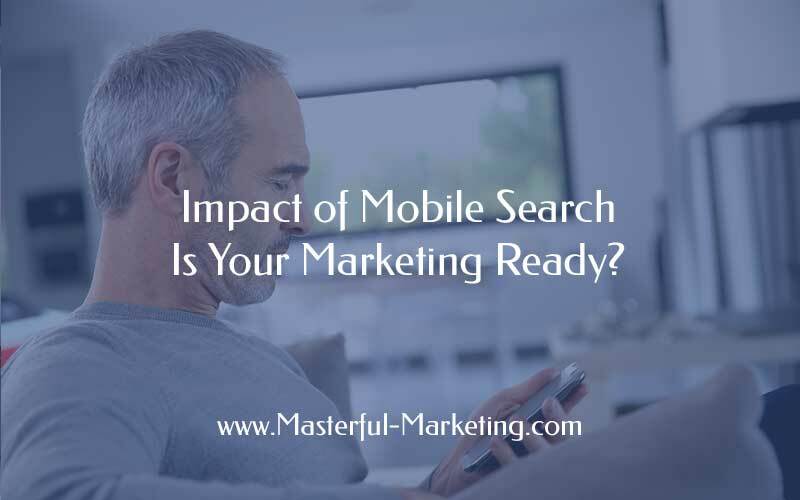 But there is no doubt that mobile search will impact your business and your marketing activities. 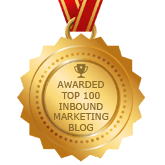 What are you doing now to prevent visitors from clicking away to your competition because your site is not the user experience they have come to expect? In a research study conducted by Google in partnership with Nielsen which analyzed over 6000 mobile searches, they discovered that mobile search is goal-oriented and conducted to help make a decision. 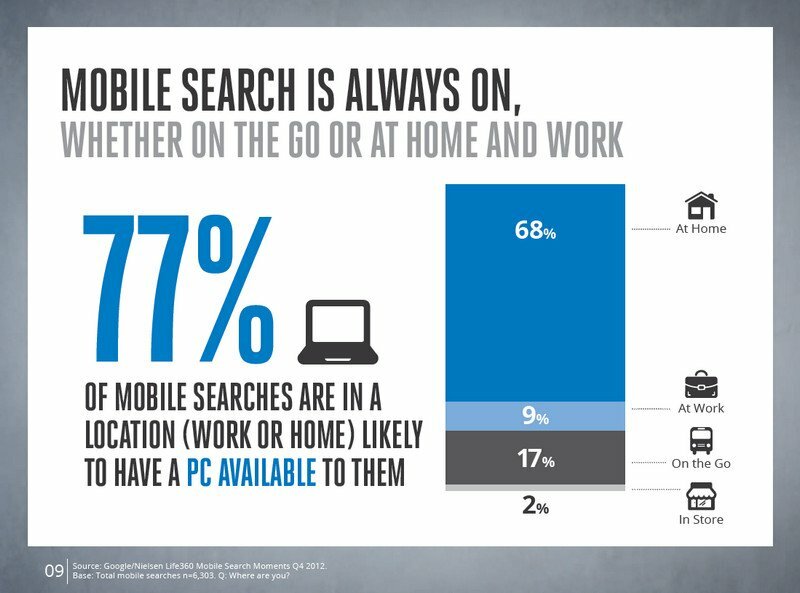 Whether people are at home, at work, on the go or in a store, web search from a mobile device is not a frivolous activity. 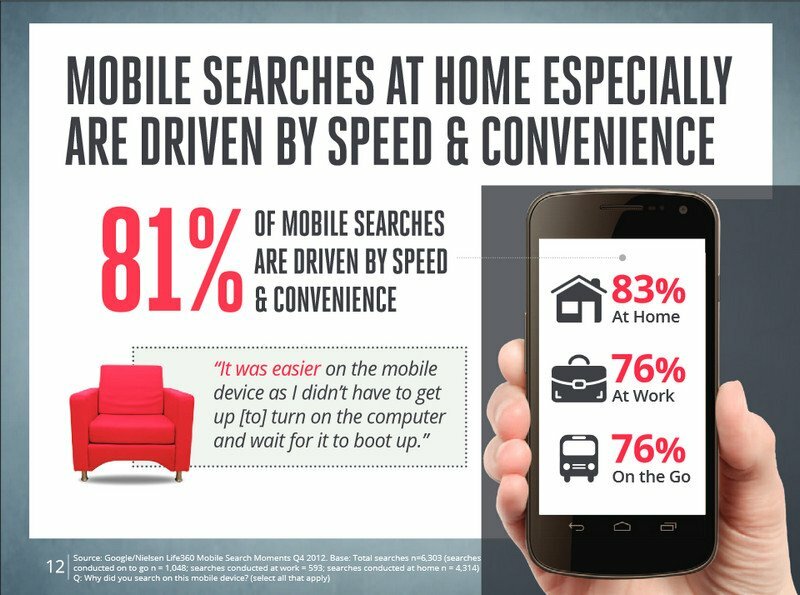 In addition, 81% of mobile searches are driven by speed and convenience because a mobile device is always on, always accessible. 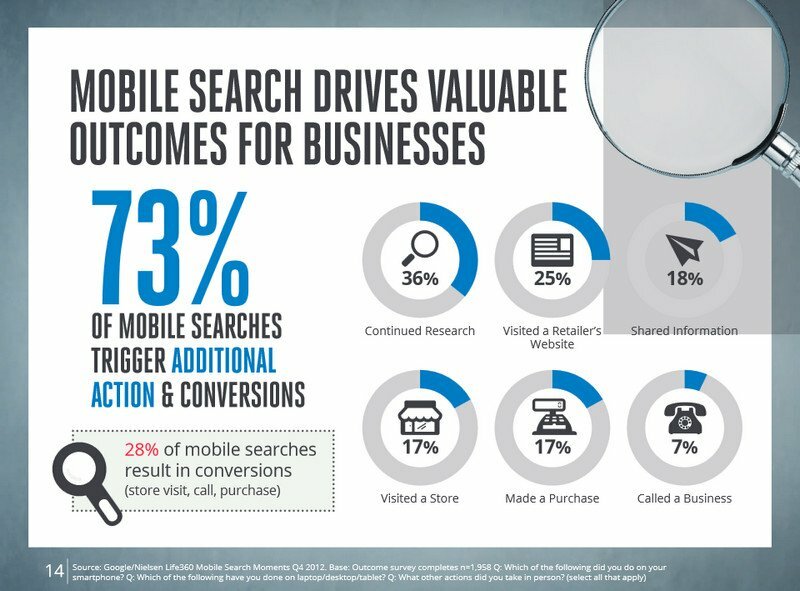 And the outcome of a mobile search is valuable to all businesses, not just business to consumer, as 73% of mobile searches trigger additional action and conversions such as additional research or contacting a vendor. Plus mobile searches trigger quick follow-ups. 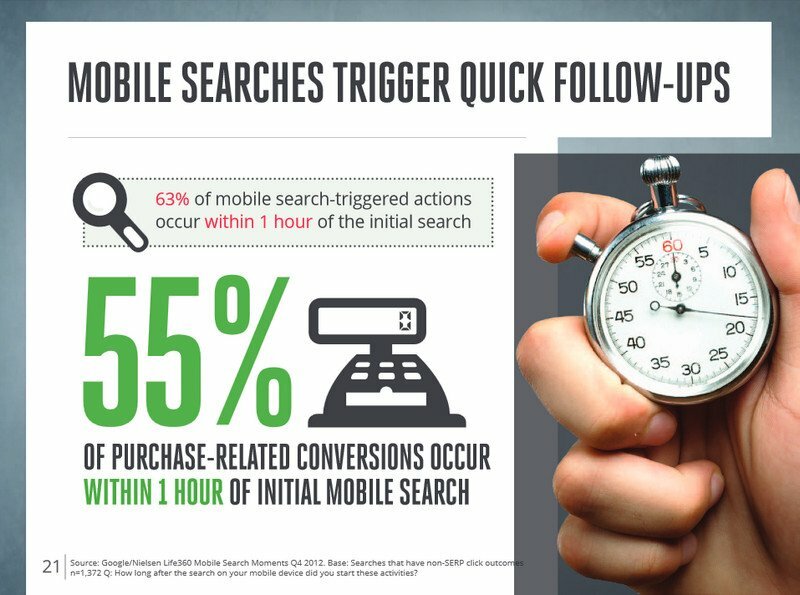 63% of mobile search triggered actions within 1 hour of the initial search and 55% of purchase related conversions occur within 1 hour of initial mobile search. 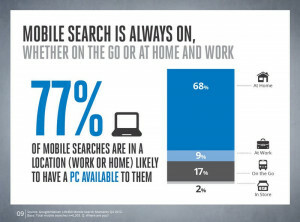 And don’t think that because someone is home or at work with a desktop available, they are not using mobile search. 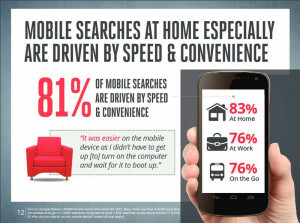 77% of mobile searches are either from home or at work. As a baby boomer, I wasn’t brought up with a mobile device in my hand plus my years in high tech may have made me a bit more tolerant of technology that is not quite up to speed (pun intended). However, my experience yesterday as we drove home from the family holiday festivities reinforces my belief that we have moved from mobile enabled to mobile optimized as a requirement for your web presence. After leaving a house full of teens (and adults) using their iPhones to search, surf and socialize, I decided to use my smartphone on the drive home to research getting an expansion SD card for my Gallaxy Note II. I found myself searching, visiting links that looked promising but then abandoning them in frustration when the page wouldn’t load quickly, I couldn’t read the content or figure out what was on the page relevant to my search because the website served a page formatted only for the browser. Thank goodness for Amazon.com as they not only had the product I was looking for but served it to me in a format that was easily readable on my mobile device. I read the reviews, checked to make sure it was available on Amazon Prime, logged in and added the product to my shopping cart. I will admit I did not click the buy button from my mobile device, but I could have. When I got home, I got on my web browser and purchased the item (old habits die hard). What this means for our businesses is that we can no longer focus on the online user experience solely around the desktop browser. In fact, designing the user experience around the mobile device user first and then expanding it to the desktop is an important shift in our thinking when designing our marketing campaigns, one that will make the user experience better for both. Move your website to a responsive design. There are many WordPress themes that are responsive so there is no excuse. There are both SEO benefits, usability benefits and conversion benefits of a responsive design. Reorganize your website content to ensure important content is seen first, including your address and a click-to-call phone number. Eliminate anything that slows down performance for mobile devices. If you need to lose the fancy widget and plugin that drives it, do it. Simple is better when it comes to your online presence in general. Test your site on mobile devices to see what your user experience is like. If anything is confusing or cluttered, streamline some more. Then make sure all pages, including landing pages, load quickly and all the links and forms work from a touch screen. Add more visual content to your marketing as mobile users are more likely to watch a video or share a picture. If appropriate, add Pinterest, Twitter Vine, Facebook, Instagram or other more visual social media sites to your marketing plan. Ensure your email marketing campaigns are readable on a mobile device. Check to see if your email service provider has templates that support both browser and mobile devices and can send the correctly formatted email to those who choose mobile. If you have a shopping cart, make sure it works on a mobile device. 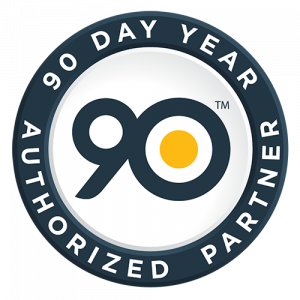 You don’t want the visitor getting all the way through the purchase process only to discover they can’t finalize the purchase. Integrate mobile advertising options into your Google AdWords campaigns using enhanced campaigns, making it easy for you to manage your campaigns across all devices with the right ads, based on their specific location, time of day and device type. Mobile is another marketing channel that needs to be a meaningful part of your marketing strategy starting now. Understand your customer and integrate mobile into your marketing plan to ensure you are able to satisfy their needs, no matter what device they are using to find the solution to their problem. What’s your plan to support mobile devices with your marketing? 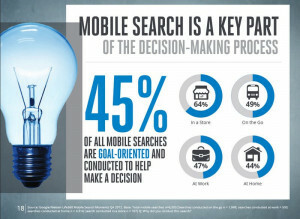 I think mobile searching is gonna be trending sooner or later. In fact, a lot of people are already using mobile devices to search the web nowadays. Either for business purposes or social media like Facebook and Twitter. I too have to modify my site to be mobile-friendly. Thanks for sharing your thoughts about it. You’re welcome. Mobile is no longer an option. Good luck! time to get my website optimized for mobile search! Especially for a local business like yours! Good luck – the effort is worth it.